Home » Archaeological-Museum » Ashoka Pillar » Bodh Gaya » Buddhist Stupa » Chaukhandi Stupa » Dhamek Stupa » Emperor Ashoka » Lion Capital » Lord Buddha » Mulagandha Kuti temple » prayer wheels » Sarnath » Satyamev Jayate » Varanasi » A spiritual day in Sarnath! 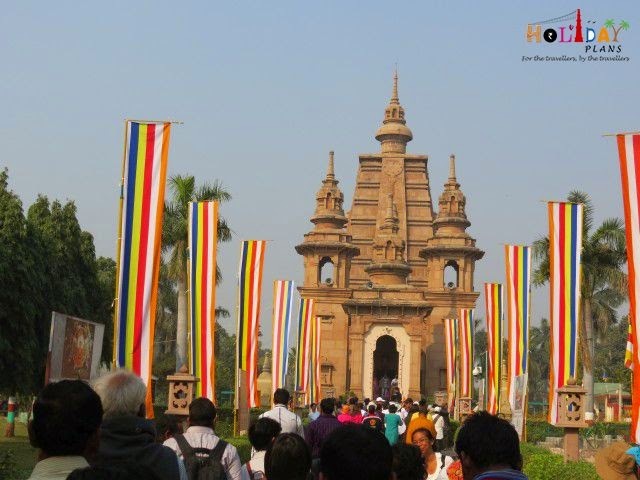 A spiritual day in Sarnath! I recently got a chance to go to a Buddhist stupa near my locality. I was influenced by the simplicity and tranquility present at the place. I had heard a lot about Lord Buddha attaining enlightenment and delivering his first sermon. 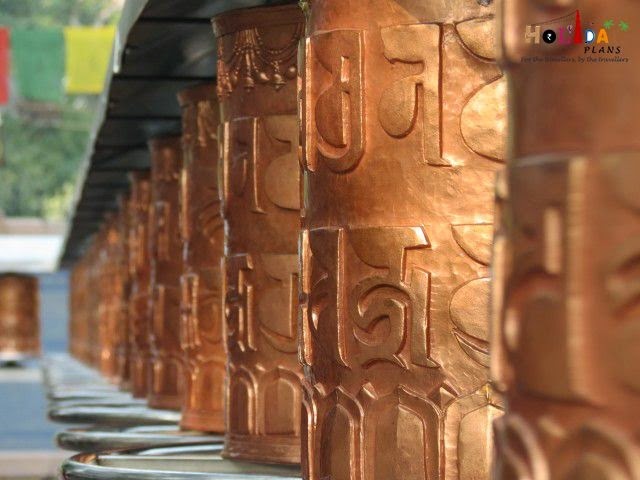 I wished to visit Sarnath to know about this. Fortunately I got a chance to visit Varanasi (I was invited to a wedding of my friend’s sister). Sarnath which is close by is one of the four major pilgrimage sites for Buddhists. It is this very place where Lord Buddha delivered his first sermon after attaining enlightenment. I along with 3 of my friends reached Varanasi early morning. Since, the wedding was at night we planned to cover Sarnath during daytime. 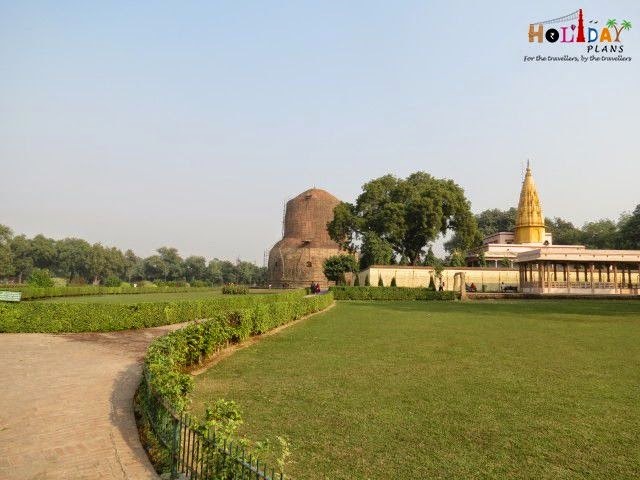 Sarnath is a city located 13 kilometres North-East of Varanasi and importance of this place comes from the fact that at this very place there is a deer park where Lord Buddha gave his first sermon on Dharma after his enlightenment. The Emperor Ashoka, visited Sarnath around 234BC,and erected a stupa here. 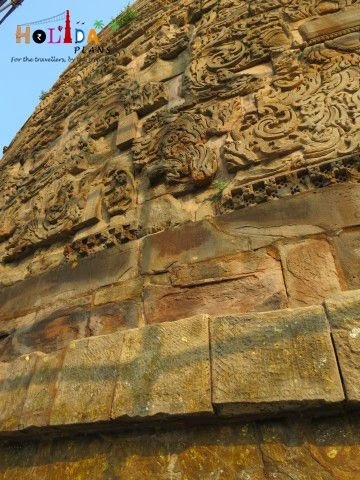 Several Buddhist structures were raised at Sarnath between the 3rd century BC and the 11th century AD.This place was raided by the Turks and most of the stupas that were present here were demolished or left in ruins. 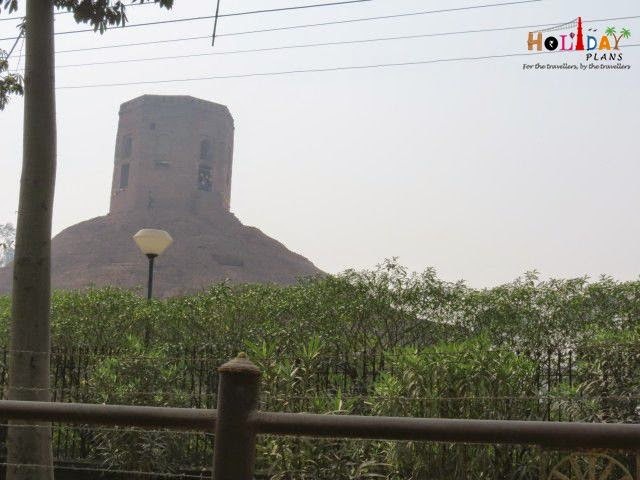 CHAUKHANDI STUPA is the first monument we saw as we entered Sarnath. It was a lofty mound of brick –work whose square edifice is surrounded by an octagonal tower. It was originally built by the Emperor Ashoka. 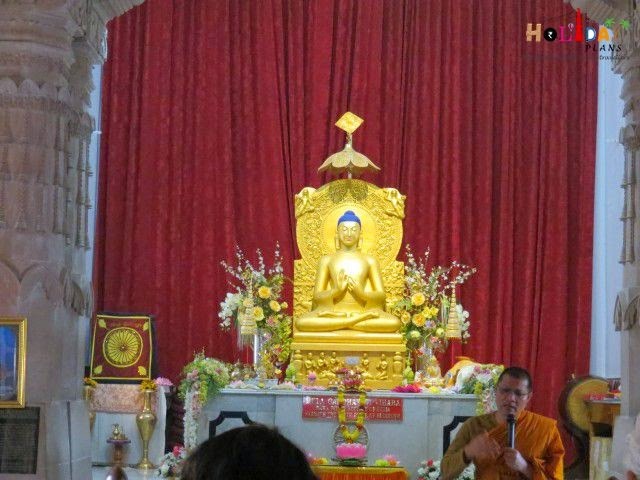 It was the very site where Lord Buddha and his first disciples met traveling from Bodh Gaya to Sarnath. Our next stop was the Statue of Standing Buddha. 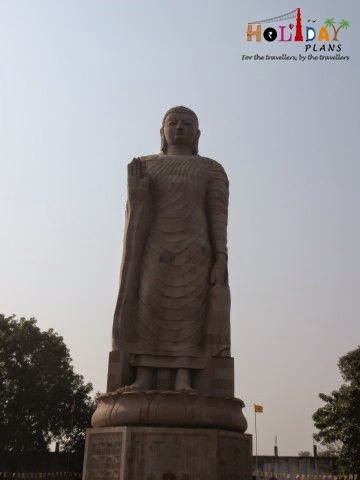 It is India’s tallest standing statue of Buddha. It is 80 ft high and it took 14 years of joint venture between India and Thailand to construct. The construction of statue is said to have started as a gesture to protest the destruction of Buddhist statues in many parts of the world. 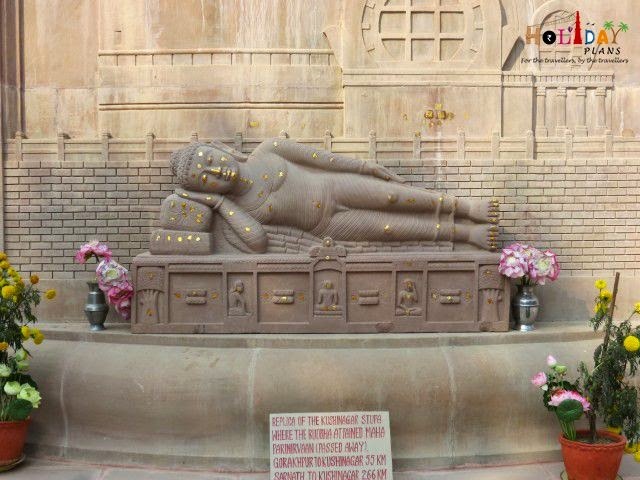 Located in the confines of the Thai Temple in Sarnath, the statue consists of as many as 815 stones. There is a beautiful garden around the statue that compliments the overall surroundings. We parked our vehicle nearby and walked on foot to explore other places. 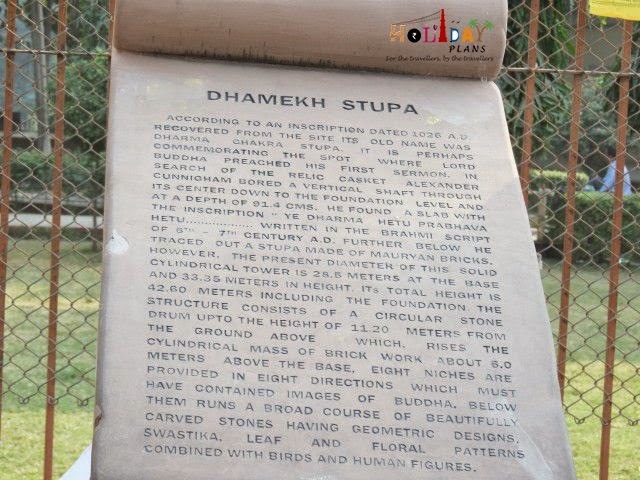 DHAMEK STUPA is the most remarkable structure at Sarnath. It is the cylindrical structure 28 meters in diameter at the base and 43.6 meters in height, built partly of stone and partly of brick. It is surrounded by the ruins of different “vihars” where Buddha spent his first monsoon after delivering the sermon. The stone facing the lower part is adorned with delicate floral carvings of Gupta origin. This dates from around 200 BC and is exactly the spot where the Buddha is said to have preached his first sermon. Next to Dhamek Stupa is the MULAGANDHA KUTI VIHAR. This modern temple has been erected by the Mahabodhi Society. 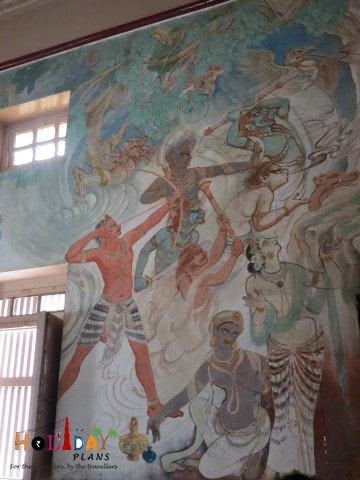 It has excellent frescoes by Kosetsu Nosu , Japan’s foremost painter and is a rich repository of Buddhist literature. 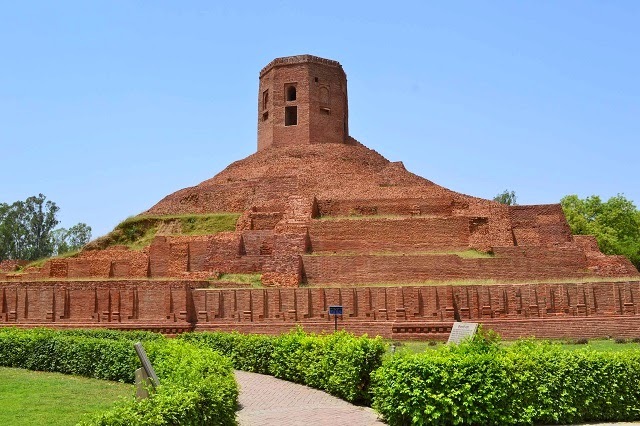 The ancient Mulagandha Kuti temple is among the brick ruins of Sarnath. Images will help you understand the beauty of this place. Apart from the Buddhist importance that this place holds , Sarnath is also famous for housing the Lion Capital or the Ashoka Pillar from which the Govt. of India adopted the Emblem of India on 26 January 1950. 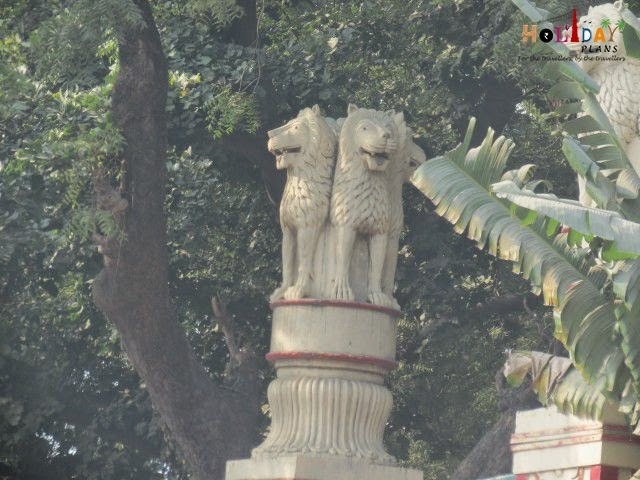 Emperor Ashoka the Great, guided by his first wife, Vidisha Devi erected the Lion capital to mark the spot where Buddha first taught the Dharma. Forming an integral part of the emblem is the motto inscribed below the abacus Satyamev Jayate meaning Truth Alone Triumphs. The Emblem consists of four Asiatic lions standing back to back - symbolizing power, courage, pride, and confidence - mounted on a circular base. At the bottom it has 1 horse & a bull, at its center it has a beautiful wheel (Dharma chakra). The abacus is girded with a frieze of sculptures in high relief of an elephant (of the east), a bull (of the west), a horse (of the south), and a lion (of the north). 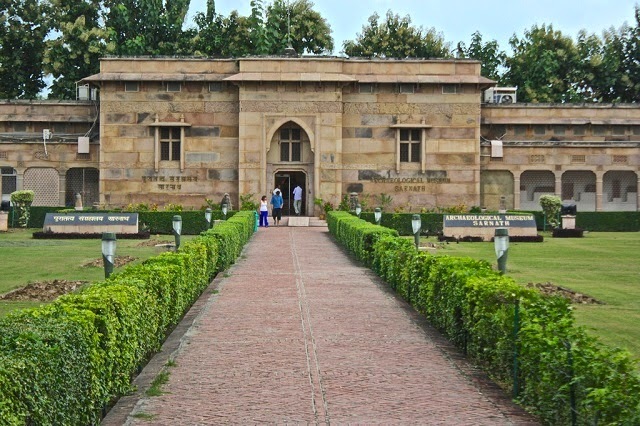 It is currently preserved in Varanasi Sarnath Museum of India. You are not allowed to take mobile phone or camera inside the museum. All of these have to deposited outside. The museum is open on all days from 9 AM - 5 PM. Entry fees to the museum is INR 5 only. Knowing a place rich in the cultural and religious aspects related to Buddhism and mankind from close was a privilege. I felt utmost satisfaction and peace from within to have known all about Lord Buddha , his attaining enlightenment , then delivering the first sermon to his five disciples , then Ashoka came in and did his to spread the word of peace. All in all this place has left a deep impression in my memory lane. 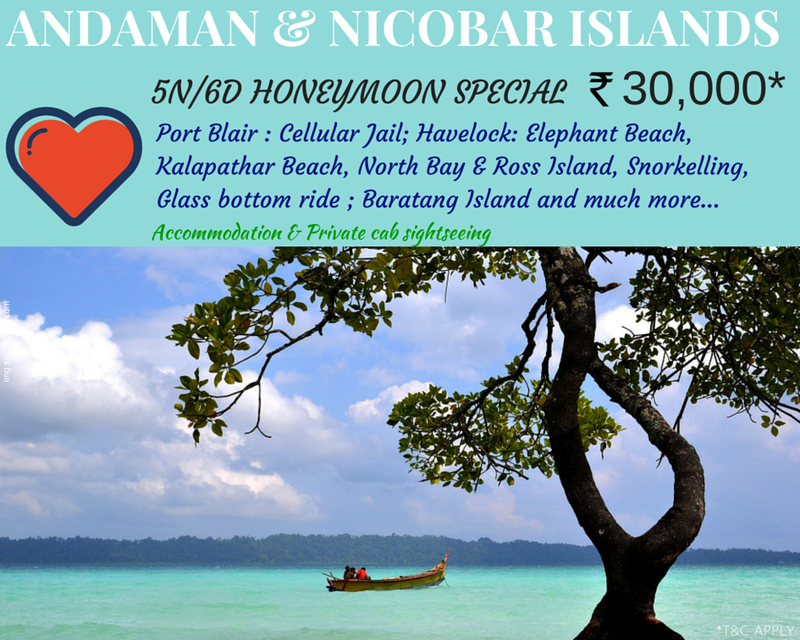 As a traveler I believe that travel makes you richer in your thoughts , this is definitely one such place! To book a customised tour to Sarnath/Varanasi, feel free to get in touch with us.